Our Donate Page Just Got A Makeover! July 1st marks the start of a new fiscal year, and to kick it off we’re giving our donate page a makeover! Our new donation and fundraising tools, powered by StayClassy, make giving to Operation USA easier than ever. 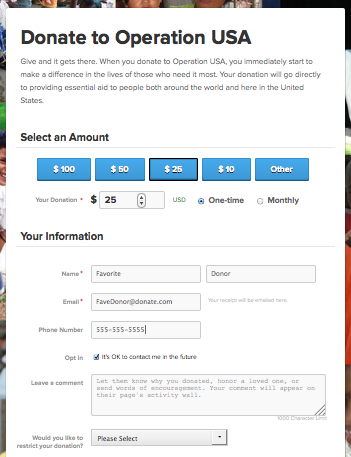 Now, when you make a donation to Operation USA, the process is simple and worry-free! Plus, when you return to make additional donations down the road, our donate form will save you time by remembering your contact info. We’re also introducing two new giving features that allow you the flexibility to give when and how you want to. Become a monthly donor to give a little at a time, and we’ll automatically collect your recurring donation each month. Or, create your own fundraiser on behalf of Operation USA and enlist friends, family and co-workers to donate or start their own fundraisers as members of your fundraising team. Donors like you make our vital programs possible, and we thank you for your support!